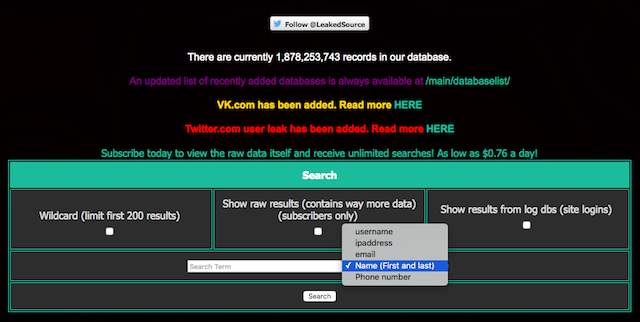 LeakedSource is a bit like the Yellow Pages for leaks. When a site gets popped, and the contents of its database find their way to the shadier bits of the Internet, LeakedSource is the site that aggregates it. In theory, it allowed anyone to check if they’d been victim of a data breach. Should you be concerned your personal details were caught up in, say, the vast moats of data flowing from sites like Ashley Madison and LinkedIn, you could check. But there was a dark side to LeakedSource. It had a business model that granted literally anyone access to their database for a fee ranging from between $2 a day to $265 a year. While, as pointed out by The Inquirer, could be useful for journalists looking for a scoop, it could also be used for more nefarious purposes. And now, it’s believed that the site has been permanently shuttered. According to a post on OGFlip (which has since been removed and mirrored on Pastebin), an unspecified law enforcement agency raided the site and confiscated the disks. It’s still not 100 percent clear what happened to LeakedSource. If, as believed, the site is gone forever, then it won’t take long for something to take its place. It’s just a matter of time.